MURRIETA, Calif. – Following a record-breaking 2017 performance up Pikes Peak Mountain with the KTM 1290 SUPER DUKE R, Chris Fillmore and KTM’s Media Racing Department are set to return for the 96th running of the iconic Pikes Peak International Hill Climb, this time aboard the Austrian brand’s latest tool in its street arsenal, the 790 DUKE. 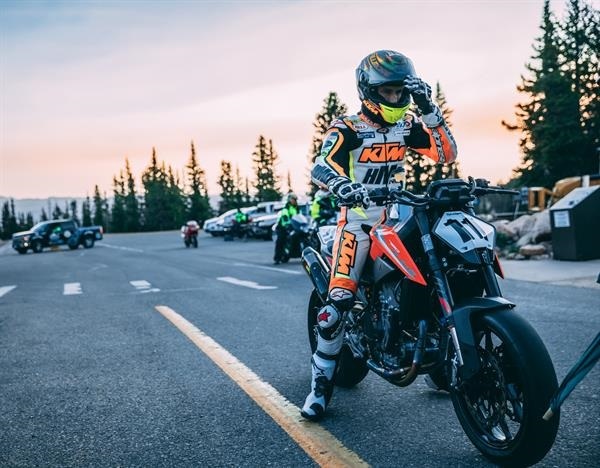 On June 24, ‘The Scalpel’ will make its highly-anticipated U.S. racing debut in the Pikes Peak Middleweight division as Fillmore attempts to top his own course motorcycle record of 9:49.265 on the 790 DUKE. With one year under his belt with the proven 1290 SUPER DUKE R, Fillmore has a READY TO RACE approach to the new challenges that come along with a new bike and new class. Unlike ‘The Beast’, KTM didn’t design the 790 DUKE to be a track weapon but the company’s race-focused philosophy allowed for an easy transition to make ‘The Scalpel’ even sharper for competition. In preparation for The Race to The Clouds, Fillmore attended the official Pikes Peak Tire Test last weekend, where he quickly adapted his riding technique for the 790 DUKE. In addition to Fillmore’s bid for the Middleweight victory, he will be joined once again by Cycle News Road Test Editor, Rennie Scaysbrook, who put forth an impressive run up the Peak in 2017 to finish second overall in the motorcycle division, giving the KTM 1290 SUPER DUKE R a 1-2 sweep. Scaysbrook is back with vengeance as he vies for the top spot in the Heavyweight division with the 1290 SUPER DUKE R, as well as a chance to own the Pikes Peak overall course motorcycle record that he so narrowly missed last year. The new KTM 790 DUKE will arrive to North American dealerships later this year. For more information on the bike, please visit www.ktm.com. For information on the 96th running of the Pikes Peak International Hill Climb, including how to purchase tickets or follow the event live, please visit the official website at http://ppihc.org.